This migraine pressure point, located inside your mouth, can often instantly eliminate your headache. It can also be used as a highly effective prevention program. Many of my patients and visitors to this website who have suffered for many years use this technique regularly with amazing benefits. This one technique along with any of the techniques on the main Natural Migraine Relief page will often instantly relief your pain and allow you to get on with your life. The follow-along videos take you step by step through everything you need to do. This short introductory video is a great place to start. It will give you a good overview of how to get the most out of this website and help you get the best possible results from the videos below. Please visit the techniques page now, if you haven't already. The techniques are extremely simple, but being familiar with them will vastly improve the effectiveness of what we do below. On the homepage I describe…in detail…the 3 Simple Steps and the 4 Basic Facts about your body that make it possible for you to provide your own joint pain relief. It's good to know why what you're about to do actually works, but it's not required, so I'll leave that decision to you. There's an extremely good chance that you can profoundly benefit from this migraine pressure point technique, so let's get to it. Also, hopefully this single technique will provide you with instant migraine pain relief, but please note that the main Natural Migraine Relief page (click here) provides a simple three step program that can add even more migraine pain relief if it is required. If you suffer from migraines on a regular basis then doing this very simple technique every morning can prevent you from getting migraines in the future. I've had hundreds of clients eliminate migraines from their lives by doing this one technique every morning, usually after they brush their teeth or in the shower. This way it just becomes part of their morning routine. 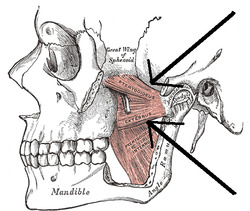 Your Lateral Pterygoid Muscle is the gold nugget of migraine headache relief. 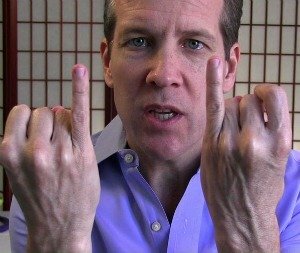 If you learn to do this technique properly it can be a tool you use for migraine headaches for the rest of your life. And as with many other techniques I show you on this website, it's very important to perform this technique on both sides of your jaw, even if the other side doesn't seem important, both sides play off and react to the tension in the other. A. Once you make sure you've trimmed the fingernail on your little fingers then you're ready to go. We'll be using the press-hold-move technique just like we do on so many muscles throughout this website. Using the hand on the same side of your body as the jaw you'll be working on, slide your pinky down your top gumline until you reach the back of your jaw. Now open your mouth about half way to maximize the space in the back of your jaw where you'll be working. Open and close your mouth as you press against the back wall and feel for the tissue that is painful when you press on it. That area (about an inch from top to bottom) is your lateral pterygoid. Investigate this whole area and continue to do the press-hold-move technique on any tight tissue you find. Feel free to take a break and work on the other side of your jaw. Go back and forth as much as you'd like. But do notice how this one point affects your migraine. If you feel you can get more release from this area, feel free to do a few more rounds, but also feel free to visit the main Natural Migraine Relief page (click here) for additional do-it-yourself migraine techniques that may finish what you started here. How effective was your migraine pressure point treatment? Is your migraine pain completely gone? Which techniques gave you the most migraine pain relief? Was there one technique that instantly provided migraine pain relief? Remember what worked best for you, so you can do that first next time you need migraine headache relief. Are you still experiencing some migraine pain? Which areas of the muscle are still tender (that means they are tight!) and could use some more work? Go back and repeat those areas that seem to need a few more rounds. Do you think you would benefit from visiting the main Natural Migraine Relief page (click here)?